Mud and Blood 4 Game Suggestions. Activity › Forums › General Forum › Mud and Blood 4 Game Suggestions. This topic contains 59 replies, has 33 voices, and was last updated by Russian 1 year, 1 month ago. Since this topic comes up now and then since the past some 10 years (?) or so and with MNB3 now going into the finals before release we should use a single thread to gather our thoughts. Some history about what MNB4 may be about as far as my memory still serves me right. Please feel free to add to this or correct false input. The MNB4 idea originally come up way back on Urbanprohet and had its own thread on MNB.net (old). What I recall is that the original theme was Mass Future Combat. So kind of a fictive World War 3 scenario. What I have seen over the many years that I am here now is that the idea of a Future Combat based MNB4 is good with the community while the Mass Combat may not be something that they can relate to. Urban Combat is also something high on the wanted list so I would suggest the MNB4 setting to be possibly near or current Future Mega City Combat. 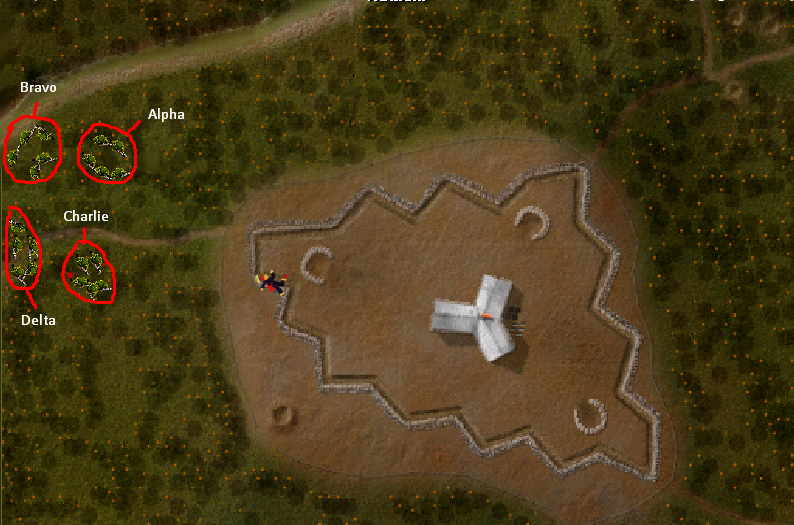 The size of your commanding combat unit could be about a Platoon with 3 Squads of 6 men each. Remember this could be a future setting and historically the units size in soldier numbers kept getting reduced. So you would have a total of 18 Soldiers to command with a very low chance to get replacements. Game interface could look like this. Imagine 3 MNB2 fields in a row with each containing one of your Squads doing their mission and you coordinating it all. Overworked Commander? No, Future URB! Yup, just another the do-it-all-alone job that we will all get stuck with eventually. Break/Rant so people can post their ideas as well or give replies to this. I remember 2 or 3 forums ago (depending on the counting method) there was discussion about next MnB game and Large map, urban setting was heavily discussed. However, things like massive troops or futuristic setting is something new to me. Personally, I do believe that while other URB titles may cover a variety of settings (fantasy STWALT, historic LW or futuristic Flagshipped), the “core” Mud and Blood, would stay somewhere around XXth century wars, reaching Middle East interventions or Afghanistan at most. either a tactical scale combat, with platoon to company size force, which sets you as the commanding officer of the force, BUT you do not contol every soldier, or even unit for that matter, directly, but instead you deploy platoons and give orders to lieutenants (or maybe sargants on some occasions) and wait for them to carry out your orders. Things like morale of the troops, motivation or ingeniuity of the lieutenant, people in his vicinity (maybe he’s creative but has trouble keeping people in line, but his mst.stg is iron-handed), training and combat experience taken into account. Then, you have to deal with things you have no control over, that are not taken into account in normal RTS games and which actual military commanders had to deal with in that time: loss of communications, reliable(or not) intel and maps, rapidly changing situation on the field, and many other occasions to get URBed hard. Other idea is, a bit similiar to MnB 2/3/Recon, where you start as corporal and lead your 4-6 man section to the specific objectives set by your direct superior, like holding a building, until the rest of the team can move up. As you rank up, you get promoted to sargeant and lead 12 men team and fullfill the tasks for the lieutenant. Then you rank up, play as lieutenant and command a platoon, and so, and so on. You get the point. Anyway, that’s just my opinion. I personally love those ideas from both Lance and Kapco , it sounds like it would be a really good game if it was made either way. I always thought it would be cool to have random hero spawns. They would come with either historical people’s names or even members from the website. The latter came when I found out about “this” website. I wish in next MnB title we could command an infantry platoon like Mud and Blood Vietnam. We could make our own squads (before deployement like MnBRecon) but have the option to either select each team or soldier individually during the game. This reply was modified 2 years ago by nexwiz. Seems like in general folks want future combat and/or a large scale of combat for the next iteration of MnB. I wouldn’t be opposed to it. My preference for a setting would simply be exclusive urban combat. Of all the combat scenarios, urban combat is historically known as one of the most unfair and brutal ones simply because of all the things involved in city combat. It also lends itself to having a bit of vertical as you attempt to secure buildings and structures with more than one floor (or level them to the ground if you really feel the need). heroes would level to lvl 10 and gain abilities, some would be good at range others would be good at melee. Some would be good against undeas while others excell against green skins. It would follow clisely the badic set of rules of dnd (no blades for clerics) and with the amount of combination of creatures and spells and loot this could lead to a very interesting sandbox experience. Stalingrad could work for either the defense oriented MnB2 or the attack oriented MnB3 setup, and there’s certainly a lot of sound assets you could use for that. In terms of combat intensity, Stalingrad saw some of the fiercest fighting so no need to shy away from having absolute carnage, which is something I think a lot of people really enjoy. But as a developer, I can understand why you would want to do a non-historical setup. You certainly get a lot more freedom when not constraint by historical details. I would love to see some big monster type enemies. Just as a quick aside, the Total War series did really well when they finally switched from historical settings to the Warhammer setting. So I definitely think using a lot of the concepts in the existing games now and applying them to a fictional universe can have a lot of pleasant synergies and opens up the possibility space for more interesting content. Alternatively, you could try a science fiction setting with some loose inspiration from Starship Troopers. This was something I had in mind a while ago as I was working on Skirmish Line. You can have a persistent squad setup as with MnB3, but your troops would be piloting mechs that you can arm with all sorts of weapons, from autocannons, missiles, lasers, and whatnot. You can have further variations with different mech types that have their own sets of upgrades. In terms of enemies, you can fight bugs, other mechanized forces, puny fleshy infantry, and so on. Lots of room for carnage for sure! This reply was modified 2 years ago by Snarks. It is after all a top game suggestion idea from the forums ever since mnb2 come to be. Adding the LW survival part would make this very interesting and a bit more unique. This would then be playing the Germans with the goal to stay alive as long as possible without surrendering? Or will there be a chance to win? Using the Recon field engine I can see our HQ being in the middle with resupplies having the chance to either come by air or on road/field from a (specific) side. Maybe we can win if we hold out long enough? This has come up a few times before and I as a D&D and MNB lover would be most pleased. Using the MNB2 engine for this would be cool. Holding out against a (the) endless hoard of baddies with D&D type of characters also sounds like a good strategic challenge. Fighter and Dwarfs to the front with each having special combat abilities. Rogue and Wizards do their ranged attacks where as the Rogue is a fast firing bow specialist and the Wizard hits on a large scale with magic attacks but needs a lot of time to charge up. Cleric can fight HtH but reduced, heals and is great vs undead by inflicting area damage to them. Elf is a jack of all trades but has low HP. Hobbits can make sneak (50%) attacks (nobody takes them seriously) while also having lots of other special abilities like looting on anyone or low level magical spells. Here I can see other characters that are not so common in classic D&D have a much greater part. Bard can be a good fighter and raise moral for us while decreasing enemy moral.= Sarge like abilities. Necromancer can raise weak enemies to fight for us. Lots of specials possible here. Barbarian can be a very strong fast fighter with great charging features but has only short ranged weapons and mid or low armor. Snarks made a great reply to this too. I especially like the Science Fiction Setting idea. Something that also has been on my mind for many years. Starship Troopers sure is a good example of such a possibility. Big Mechas like say in the original Battle Tech (old TSR game) would work real well for a MNB4 like future mass combat setting. You would have a Squad of Mechs and either attack or defend (attack would be better) against mainly mass Infantry, lots of vehicles and another Mecha now and then. Upgrades and supports would work great here too. Whatever you do urbzz it will be awesome!!! I like the idea of an Afghanistan Recon set in the modern world. I also would like to see WW1 trench warfare similar to the concept of the original Mud and Blood but done in MnB2 fashion. Science Fiction would be cool on a larger scale. A fast paced Old Republic Star Wars game would be excellent fun. I currently support expanding Recon for the meantime. This reply was modified 2 years ago by Lt.Dan. I recall urbzz mentioning a very inspiring concept of a MNB1 Redux game. Not in a mnb2 way. Basically the original concept where you do not directly direct soldiers/units to move on a (the) play field but you play as the area commanding officer who uses everything to his disposal to win at a certain front line battle zone. urbzz had a specific one in mind. Battle of the Somme from 1916 onward I believe but that could be wrong. It was not Verdun for sure. This was mainly a British battle. Tactically it contained just about all old and new WW1 units available inc the first British tanks and effective Air Recon and Attack missions. Tunneling, the use of Shock-Troops as well as effective Gas Attacks. I really hope that this will at least come out as a trial game soon. I like Lt. Dan’s suggestions A modern day recon would be a very, very great game to play . I was wondering if we could have something more Medieval to as well like Stwalt but more realistic. By more realistic I mean with human enemies or large ferocious animals and such. You could play as several classes too , explore a map and do missions. Hello! I’m Naz’r Titington and I am a very huge fan of your game MnB without a doubt I have been playing it for years and even while in college and serving as a soldier in the US Army I still play it in my off time. I am very hyped for MnB3 and I cannot wait to play it like many others! But I was thinking about the series and future project ideas. To me the best MnB was MnB2 due to the excitement and randomness of enemies coming your way wave after wave. My idea I wanted to shoot was maybe for a future MnB you could bring that wave system and style back but simply revamp everything from the terrain, features, equipment, graphics, and soldiers and match it to a specific era? So for example lets say MnB3 was the same setup as MnB2 and the era was Vietnam, you could change the main menu pictures to Vietnam war photos, and when you start the game same start just like MnB2 but it would be Vietnam Soldiers and their equipment would be maybe an m16 and an M9 or something of the sort. The unit tree would be updated with maybe new symbols and such and have all sorts of new “toys” to play with and having guns match them, hell some of our favorites like Sarge can still be there just simply with new equipment and gear maybe more animations like him drinking from his flask or something. I just think it would be a great idea to do that because the system you guys had for MnB2 was perfect in my book! Please for an upcoming project bring it back but in another era with more stuff, and you can still do updates such as having that ability system from MnB3 enabled or something. I just would love to have the MnB2 setup but be in different eras, hell especially if you have one for modern warfare! Would be American Soldiers defending from waves of Taliban and such or something. This reply was modified 1 year, 10 months ago by Arise.